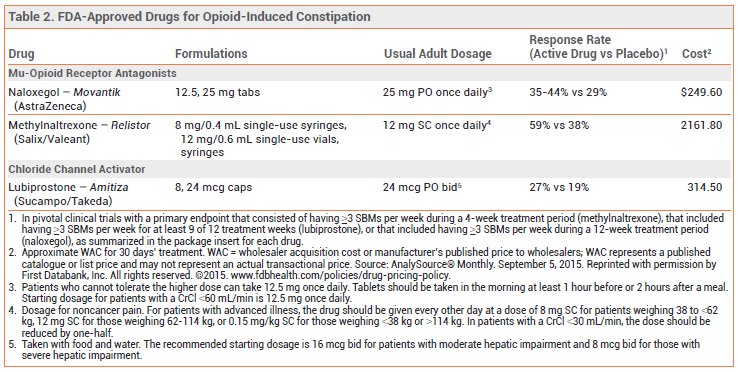 Naloxegol (Movantik) for Opioid-Induced Constipation | The Medical Letter, Inc. MECHANISM OF ACTION — Opioids exert their analgesic effect by stimulating mu receptors in the central nervous system (CNS), but they also stimulate peripheral mu receptors in the gastrointestinal (GI) tract, leading to decreased muscle contractility, inhibition of water and electrolyte secretion, and increased rectal sphincter tone.5 Naloxegol is a peripheral mu-opioid receptor antagonist. Pegylation reduces the ability of naloxegol to cross the blood-brain barrier and makes it a substrate of the efflux transporter P-glycoprotein; these properties are thought to minimize its interference with opioid analgesic effects in the CNS. CLINICAL STUDIES — FDA approval of naloxegol was based on two identically designed 12-week trials in 652 and 700 patients with opioid-induced constipation who had been taking a stable dose of an oral opioid for noncancer pain.6 Patients were randomized to once-daily treatment with naloxegol 12.5 or 25 mg or placebo. Response was defined as ≥3 spontaneous bowel movements (SBMs) per week for 12 weeks and an increase from baseline of at least 1 SBM per week for ≥9 of the 12 weeks and ≥3 of the final 4 weeks of the trial. Regular laxative use was prohibited during the trials. Significantly more patients responded to naloxegol 25 mg than to placebo in both trials (44% and 40%, respectively, vs 29%). The response rate with the 12.5-mg dose was significantly higher than with placebo in the first trial, but not in the second (41% and 35% vs 29%). Prespecified subgroup analyses of patients who met criteria for an inadequate response to laxatives before randomization found that their response rates (a secondary endpoint) were similar to those of the overall study population (43% and 49% with naloxegol 12.5 and 25 mg, respectively, vs 29% with placebo in the first trial, and 47% with naloxegol 25 mg vs 31% with placebo in the second). Median times to first post-dose SBM (another secondary endpoint) in the two studies were 6 and 12 hours with naloxegol 25 mg, compared to 36 and 37 hours with placebo. ADVERSE EFFECTS — The adverse effects of naloxegol are dose-related; the most common have been GI-related, including abdominal pain, diarrhea, nausea, flatulence, and vomiting. Patients who were receiving methadone as their analgesic had a higher rate of GI adverse effects than those receiving other opioids. GI perforation has been reported with use of methylnaltrexone; naloxegol is contraindicated in patients with GI obstruction or at increased risk of recurrent obstruction. Possible opioid withdrawal (defined as ≥3 adverse effects potentially related to opioid withdrawal, such as hyperhidrosis, chills, anxiety, or irritability, occurring on the same day and not all GI-related) occurred in 3% of patients taking naloxegol 25 mg and in 1% of patients taking 12.5 mg, compared to <1% of those taking placebo. PREGNANCY — Naloxegol is classified as category C for use during pregnancy. There are no adequate studies in pregnant women. No adverse effects were observed in pregnant animals given very high doses of the drug. Use of naloxegol in women who are pregnant or breastfeeding could precipitate opioid withdrawal in the fetus or infant because of an immature blood-brain barrier. Taking naloxegol with another opioid antagonist should be avoided because of possible additive effects and an increased risk of opioid withdrawal. DOSAGE AND ADMINISTRATION — All maintenance laxatives should be stopped before initiating treatment with naloxegol, but can be restarted after 3 days if symptoms persist. The recommended dosage of naloxegol is 25 mg once daily in the morning at least 1 hour before or 2 hours after a meal; the daily dose can be reduced to 12.5 mg in patients who cannot tolerate the higher dose. The starting dosage for patients with a CrCl <60 mL/min is 12.5 mg once daily. Naloxegol tablets should be swallowed whole and should not be crushed or chewed. CONCLUSION — Naloxegol (Movantik) is the first oral mu-opioid receptor antagonist to be approved for treatment of opioid-induced constipation. It may be more effective than lubiprostone (Amitiza) and is cheaper and more convenient to administer than methylnaltrexone (Relistor), the other drugs approved for this indication, but no direct comparisons are available. It has not been studied in patients taking opioids for cancer pain. Laxatives and stool softeners should generally be tried first. Alvimopan (Entereg) for postoperative ileus. Med Lett Drugs Ther 2008; 50:93. HC Bruner et al. Clinical utility of naloxegol in the treatment of opioid-induced constipation. J Pain Res 2015; 8:289. WD Chey et al. Naloxegol for opioid-induced constipation in patients with noncancer pain. N Engl J Med 2014; 370:2387. L Webster et al. Randomised clinical trial: the long-term safety and tolerability of naloxegol in patients with pain and opioid-induced constipation. Aliment Pharmacol Ther 2014; 40:771.